A legend my parents always told me that during the hungry post-war years the store shelves had nothing but caviar and people weren’t interested. They wanted the actual food – bread, butter, meat and there is only so much caviar a person can eat even if it’s a prized delicacy. 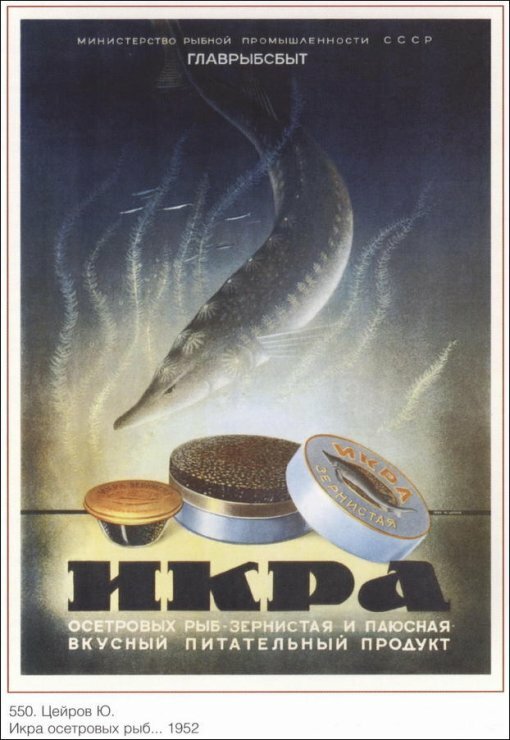 The government even felt necessary to advertize the caviar as a tasty and nutritious product. Sturgeon Caviar- Tasty Nutritious Product. By the time I was growing up©, no advertisement was necessary – in all my years I’ve never seen caviar sold in a store, with or without standing in lines; it disappeared from the retail long before it ever got near the store shelves. The only time I actually saw caviar being sold was at the cafeteria of the hotel “Rossiya” (Russia) near the Red Square in Moscow, now demolished. The hotel was intended for the foreign tourists, so a rare Soviet citizen was ever exposed to the sight. The rest of the people were having fun naming other things “caviar” and trading tongue-in-cheek jokes in the movies. Nevertheless, the caviar was still being made (or is it harvested? ), and was available to pretty much anyone who was willing to pay inflated black market prices. Pre-made caviar sandwiches were a staple of many birthday and wedding tables. The caviar particles were strategically placed on the buttered bread to cover the most surface with the least amount of substance – the stuff was expensive. In this country it’s rare to see caviar served and an average American will stop eating a plate of cutely named “mountain oysters” just long enough to point out that the caviar is nothing but salty and disgusting fish eggs. To each his own, indeed. Locally the caviar is available at the Russian store, which I always promote here for no financial gain; I’ve seen it at Costco around Christmastime; probably some expensive gourmet stores would have it, as well as various mail-order retailers. The cheap stuff sold at your local grocery store is not caviar, no matter what it says on the lid – it’s a fish roe and it’s probably salty, that’t about all it has in common with the real stuff. And now to the photos made in 1960 in the Astrakhan Region of Russia.